This guest chair is beautifully upholstered in black vinyl. 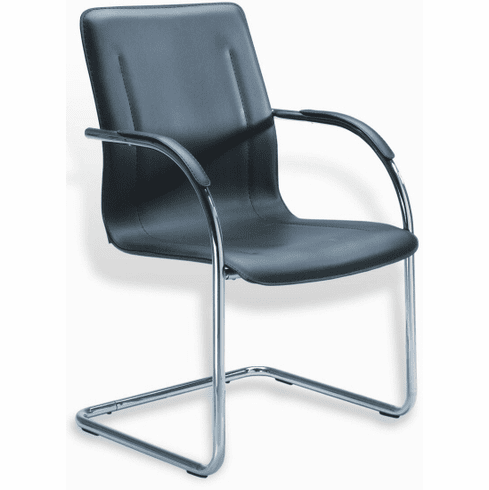 Features include mid-back styling with lumbar support and a contoured back, single piece construction with solid plywood structural frame, padded foam on seat and back for added comfort, sturdy chrome or black tubular steel frame and upholstered vinyl armrests. Easily wipes clean using a damp cloth. Available only in packages of four chairs per carton. Dimensions: Seat size: 20.75"W x 18.75"D. Back size: 20.75"W x 20.5"H. Seat height: 19.75"H. Warranted by Boss Office Products. These chairs normally ship within 3 business days from our GA or CA warehouse. *Ships by tractor trailer due to the size. Customer will need to unload the chairs from the tailgate of the truck. Inside delivery is optional.